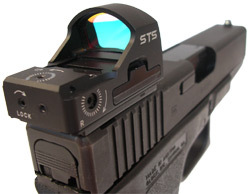 The STS2 is C-MORE Systems smallest reflex sight. 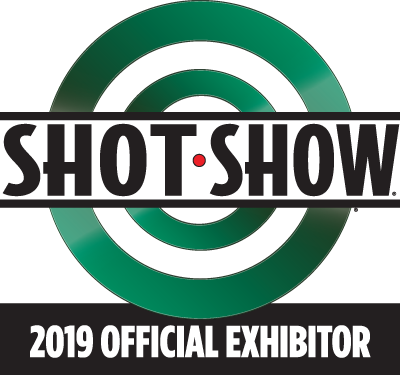 Just like our competition sights, the STS2 head up display provides an unobstructed sight picture in which the red dot hovers on the sight line, illuminating the point of impact on the target, creating the fastest target acquisition in existence, and unlimited eye relief. Similarly it uses a beam-splitter lens made of glass; hard coated for maximum scratch resistance, and light transmission, while the parallax free design enables targets to be acquired without the need to center he dot in the lens. 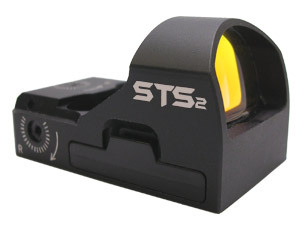 The STS2 uses a CR2032, lithium battery that is contained within a removable battery tray which permits battery replacement without dismounting the sight; this eliminates the need for re-zeroing when replacing a battery. The battery tray is O-ring seled, and is part of the waterproofing that goes into every STS. A 10 position manually operated push button switch provides precision intensity adjustment, previous intensity return, and auto off after 8 hours of inactivity. The STS2 aircraft alloy housing and electronics are designed to handle the hottest loads from large caliber firearms. 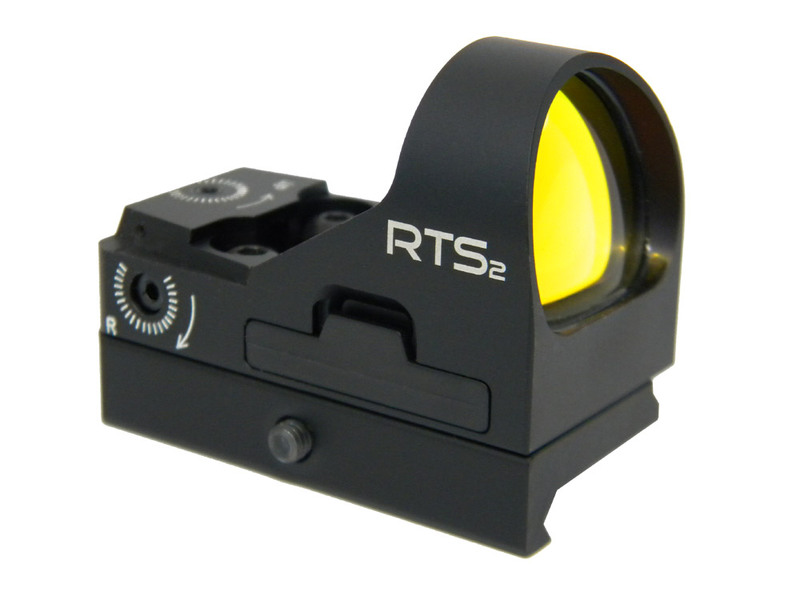 The STS2 provides 1 moa click adjustment for windage and elevation resulting in pin point accuracy. A positive locking screw for both windage and elevation lock the adjustment screws in position. 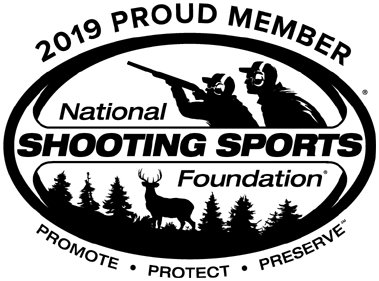 There are two STS2 models to choose from, the diferences being the size of the dot. 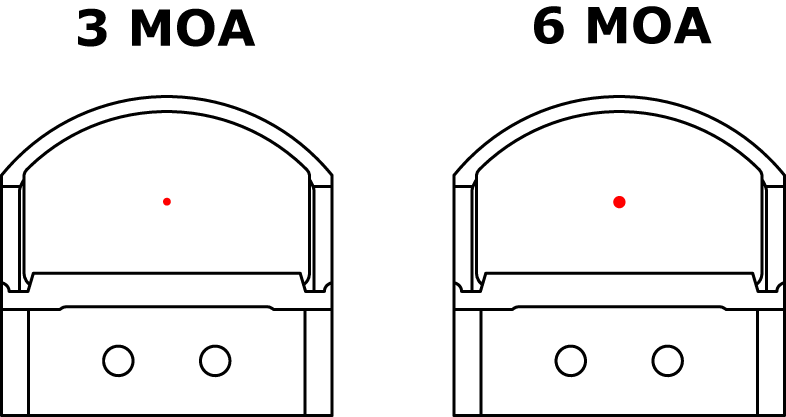 These sights are available in Black only with a 3 or 6 MOA dot. 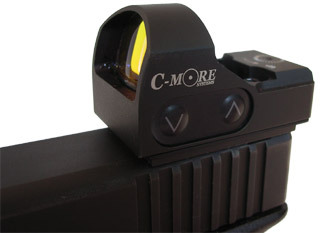 The dot size cannot be changed via plug in modules like the standard C-MORE sights. 1 STS2 Sight, 1 Protective Sight Cover, 1 CR2032 Battery (Installed), 1 Sight Adjustment Wrench, 2 Direct Mounting Screws w /Wrench, 1 Instruction Manual. STS2B-3 STS2 Red Dot Sight Black 3 MOA Fits many applications using C-MORE mounting kits (sold separately) or directly mounted to custom mounts. STS2B-6 attached to Glock 19 using STSMT-115 dovetail mounting kit. Height - Overall 1.063 in. Weight (with battery) 1.25 oz. Weight (without battery) 1.17 oz. Sight Window Width .946 in. Sight Window Height .604 in.